This 12 day Manali-Leh-Srinagar motorbike odyssey takes you across some of the most extreme landscape that the country has to offer. Bikers from around the world come together for this ride. From camping under the stars and riding through desolate landscape, to battling the weather and the roads, this Manali to Srinagar motorbike trip will be one you'll never forget. PRICE VARIATION: This Manali-Leh-Srinagar motorbiking trip package is for 1 rider PLUS 1 pillion rider. NOTE: There is an additional refundable deposit of INR 10,000 per bike to be paid before the start of the Manali-Leh-Srinagar motorbiking trip. You'll start your Manali-Leh-Srinagar bike ride in Manali, and pass through the green valleys of Himachal and into the rocky vistas of Leh and Ladakh. You'll thunder through some of the highest motorable passes and roads in the world, including Khardung La and Baralacha La. After that, you'll ride onwards to Pangong Lake and the Nubra Valley, seeing views that you'll never forget. As you cross into Kargil, and head to Srinagar via Sonmarg, you'll feel like you've stepped into a movie set. En route, you'll be staying at clean, comfortable guesthouses or hotels, or camping on the banks or rivers, lakes, or in the laps of mountains. • Test your motorbiking mettle with this extreme Manali-Leh-Srinagar road trip. • Ride through Khardung La, one of the highest motorable passes in the world. • Camp beside Pangong Lake and on the banks of rivers. 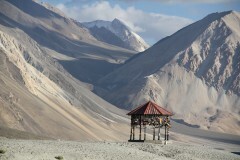 • Explore Leh, Nubra Valley, Sarchu, and other fascinating locations. • End this long trip in gorgeous Srinagar. During the Manali-Leh-Srinagar motorbiking trip, you must wear a helmet at all times. You will also be required to carry your ID at all times. Any damage of the bike/helmet during the tour will have to be paid for by the guest. Before starting the Manali-Leh-Srinagar motorbiking trip, all riders and pillion riders have to sign an Indemnity form. Participants who leave the group mid-way (for health/medical or other reasons) will have to pay any extra costs and for transporting the bike back to the start point. Compensation for any damage/accident done by you during the Manali-Leh-Srinagar motorbiking trip to others' property/person would be directly payable by you. For cancellations made 45 days or more before the departure of the Manali-Leh-Srinagar motorbiking trip: 75% of the trip fees will be refunded, minus any transaction charges. For cancellations made 30-44 days before the departure of the Manali-Leh-Srinagar motorbiking trip: 50% of the trip fees will be refunded, minus any transaction charges. For cancellations made 0-29 days before the departure of the Manali-Leh-Srinagar motorbiking trip: No refund. The operator reserves the right to change the dates of departure of the Manali-Leh-Srinagar motorbiking trip if it is deemed unsafe. The operator will not be held responsible for any change in itinerary of the Manali-Leh-Srinagar motorbiking ride due to reasons beyond control, like change in flight and train schedule, cancellation of flights/trains, political disturbances, natural phenomenon, etc. You'll have to report to Majnu ka Tila in Delhi by 17:00 hrs. You'll meet your team here, and will board the bus after that. You'll be travelling all night, so do make sure you're comfortable. There are no meals included today, but the bus will halt at a restaurant/dhaba where you can pay for your own meal. Overnight in bus. You'll arrive early in the morning and check into your hotel. You'll have the rest of the day to rest, or to explore the beautiful town of Manali. In the second half of the day, the bikes are allocated and you'll get to do a short ride to try your bike out. Overnight stay in a a riverside campsite on triple sharing basis. After a hearty breakfast, you'll begin your first day of riding. You'll ride on the Manali-Leh highway, towards Jispa. The first check point for the day is Rohtang Pass, at an altitude of 13,047 feet. At Jispa, you will be staying in a hotel on triple sharing basis. After a hearty breakfast, you'll hit the road again. Today you'll go thorugh Baralacha La, a pass located at an incredible 16,000 feet. Participants sleep overnight in camps with attached washrooms on triple sharing basis. You'll start your ride towards Leh, going through Tanglang La (17,585 ft) which is the third highest motorable pass in the world. 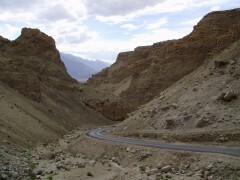 Later in the afternoon, you will cross the Indus valley and arrive at Leh. Overnight stay in hotel with attached washrooms. You'll be spending the day in Leh today, to give you time to rest and acclimatize. Make sure you don't do anything too tiring. Take a nap, stay hydrated, eat regular meals, and maybe take a short walk into the city in the evening. Overnight in a hotel. Today you'll be seeing some truly spectacular scenery. You'll ride through Khardung La, the highest motorable road in the world, and into the Nubra valley. With rolling sand dunes and scree slopes that stretch into the distance, it feels like you're the only ones in the world. You'll also visit Diskit, the largest monastery in Nubra valley and Hunder, also known as the Cold Desert famous for double hump camel rides. Overnight stay in deluxe tents with attached washrooms. Today you'll set off on an adventurous ride to Pangong Lake, navigating your bike over the rocky route parallel to the winding Shyok river. Your campsite is beside the gorgeous Pangong Lake, in Swiss tents with attached washrooms. It's time to head back towards Leh. 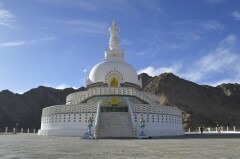 You'll ride from Pangong to Leh, through Chang Pass, stopping en route to see Choglamsar and Shanti Stupa. Back at Leh, you'll check into your hotel for the night. Overnight in a hotel on triple sharing basis. Today you ride into Kargil. It's a very scenic journey and you'll have a hard time deciding where to stop to look at the views. You have about 200 kms to cover, which will take about 5 hours. You'll get to Kargil by late afternoon, and will check into a hotel there. You'll be able to spend the rest of the day exploring Kargil. It's your last day of riding for this Manali-Leh-Srinagar trip, and you'll be passing through some of the most epic landscapes today. You'll ride from Kargil to Srinagar today. You'll be covering about 200 kms today, going through Sonmarg to get to your destination. You'll reach Srinagar by late afternoon, where you'll check into a hotel. Wake-up and check out of the hotel. Your trip ends here. Participants must hold a valid driving license. You'll catch the Volvo from Delhi today. It's an overnight journey, so make sure you've got drinking water and snacks. No meals are included today, but the bus will stop at a restaurant/dhaba, where you can pay for your own dinner. Overnight in a campsite in Manali. Arrive in Manali and spend the day at leisure. You'll be accommodated in deluxe tents with attached washrooms in Manali. Today's meal package includes dinner only. Overnight in a hotel in Jispa. You'll spend the night in a hotel in Jispa, with comfortable rooms on triple sharing basis. Today's package includes breakfast and dinner. In Sarchu, you'll spend the night in a deluxe tent with attached toilets, on sharing basis. Today's package includes breakfast and dinner. You'll spend the night in a charming hotel in Leh, sharing rooms with attached washrooms. Triple sharing only. Today's package includes breakfast and dinner. You'll remain in Leh today, to make sure you're fully acclimatized for the day ahead. Your package for the day includes breakfast and dinner. In Nubra, you'll spend the night in a deluxe tent with attached toilets, on sharing basis. 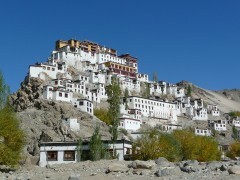 You'll return to Leh tonight, and spend the night in the same hotel. Rooms have attached washrooms and are on triple sharing basis. Tonight you'll stay at a hotel in Kargil. The rooms are on triple sharing basis, and have attached washrooms. Overnight in a hotel in Srinagar. You'll arrive in Srinagar today, and will check into a hotel here. The rest of the day is yours to spend as you please. Breakfast and dinner are included today. Check-out of the hotel and proceed to your next destination. Today's meal package includes breakfast only. Your trip ends here. There are no meals included today. You will have to report to Majnu ka Tila by 17:00 hrs for this Manali-Leh-Srinagar biking trip. 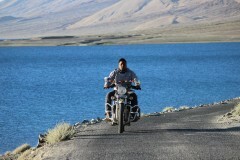 Your tour operator will arrange your transport to the start point of the Ladakh motorbiking trip.